Bone broth is the old way of doing things and how broth should always be made. Where most packaged stocks and broths are made with some meat and veggies, bone broth is made from cooking down the bones with some veggies for added flavor and nutrients and a little apple cider vinegar to help leach all of the amazing nutrition from those bones. It is how our ancestors had been cooking for thousands of years. Bone broth is a nutrient dense food that makes a great addition to your soups, stews and other recipes. It is so good for you that you can and should heat up a mug for a drink just by itself. 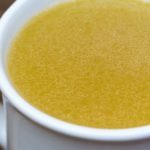 Bone broth health benefits are numerous – read on to discover how this ancient broth can improve your health today. Aside from simply drinking a warm mug of bone broth during the day, you can use bone broth in many ways. These can also be a great way to get picky family members to consume more bone broth if they are turned off from drinking it straight. Use bone broth to make a hearty soup or stew with added meat and a variety of veggies. Add bone broth to your next casserole or even to your next sauce to thin it out. Use bone broth in place of water when boiling vegetables, or cooking rice or gluten free pasta. Blend bone broth with steamed cauliflower and some fresh herbs for a delicious mash. Bone broth contains tons of collagen, the protein that makes up bones, tendons, ligaments and other flexible tissues. The glycine and glutamine – both amino acids found in large quantities in bone broth – help maintain the integrity of the intestinal wall, preventing leaky gut. The density of minerals and nutrients from the bone marrow offer great support to your immune system and will help fight off your colds as well as offer relief of your symptoms. Be sure to read Natural Remedies 101 for more amazing home remedies to help you fight off your colds this season. The glycine in bone broth not only supports joint health and digestion but has also been proven to help boost memory as well as contribute to a better nights sleep. Is it really so important to use bones from grass-fed or pasture-raised animals? Absolutely! When a cow or a chicken is allowed to graze and forage as it is instinctually meant to, the nutritional make-up of the meat and the fat is completely different than that of a cow or chicken raised conventionally in a cage, fed a diet of grains that the animal was never meant to eat. When you are making bone broth, you are concentrating those nutrients to make a super food for your kitchen and for your health. All of the health benefits above are going to be best achieved from using bones from grass-fed and pasture-raised animals. Bone broth is one of the most economical recipes you can make and will help stretch your budget. If you find it challenging to eat healthy on a budget, you need to start adding bone broth into your diet more often. Your health and your wallet will thank you! Easily make your own bone broth by saving the bones from your roasts or dinners through out the week. Ask the butcher for them if you don't want to wait and they will give you what they have set aside as soup bones from butchering the meat to sell. Making your own bone broth is a great opportunity to let your Instant Pot or slow cooker work for you. Just set the bones in the pot with your mirepoix of vegetables (carrots, celery, and onions), aromatics (garlic, fresh herbs, and spices), and some apple cider vinegar and allow this to cook on low up to 24 hours (2 hours for the Instant Pot!) for maximum nutrient extraction. You can use the same beef bones a few times for your homemade bone broth. Marrow rich beef bones will hold up and continue to leach out amazing nutrients for you. Chicken bones, on the other hand, don't hold us as well so you will most likely only get one batch of bone broth from chicken bones. Roasting your chicken bones will help them from breaking down quite so much, will elevate the flavor of your broth, and give it a more golden color. One key hallmark to high quality homemade bone broth is that it will gel when chilled. Sometimes people are unsure of what to make of this the first time they see it. Rest assured that this is exactly what you want. A gelled bone broth is a great sign that you successfully rendered the gelatin rich marrow from the bones. This is another place where the chicken bones with differ however. You may notice that you don't have as much of a gel when you make chicken bone broth. The bones of the chicken are not as rich in gelatin as beef bones. You will get more of the gel if you use other parts of the chicken as well, such as the feet. The best part about making homemade bone broth it that you can make a large batch of it and freeze it for future use so that you always have it ready to use! While bone broth will stay fresh in the fridge for a few days, it will keep in the freezer for up to a year. Bone broth can be canned to help preserve it as well, however the canning process may lose the gel strength. This would not be the ideal method for retaining maximum nutrition, but it is another option preserving your broth. Bone broth also makes an excellent supplement for your pets. It is easy for your dog or cat to digest and will give them a great nutritional boost to support their joint health, which can be a big issue for the furry members of our family. Small bones can be hazardous to our pets so please, as you would for yourself, strain the broth well before serving. You may not have the time or energy to make a big batch of bone broth yourself all of the time. If you decide on a whim that you want to make a certain recipe, not having broth in the fridge may stop you from getting it together. That's why I love Kettle & Fire Bone Broth so much! I can keep their broth on hand to throw a delicious and healthy meal together for my family in a flash. It is, absolutely, hands down, the only packaged broth I will ever use. It is the only packaged broth I would ever suggest you use. If you're serious about bone broth health benefits, Kettle And Fire offers the cleanest option for healthy bone broth anywhere. So why is Kettle & Fire Bone Broth so different from ever other packaged broth and stock out there? Fresh, never-frozen bone broth. Kettle & Fire is the only company that has a fresh bone broth that won’t go bad, doesn’t require freezing and doesn’t ship with harmful styrofoam containers and dry ice. They use NO preservatives or additives of any kind. Kettle & Fire's product is shelf stable because they use their packaging equipment to seal the package in a vacuum, so no air can get in and cause the product to spoil. 100% of their bones are from organic, pasture-raised and grass-fed cattle. Kettle & Fire provides cheap (or free) shipping. Because their product doesn’t ship frozen, they are able to ship anywhere in the U.S., often for less than $10. And, when customers buy 6 or more units, shipping is free! I find it absolutely hilarious that this is a “new” thing. I been consuming it for 40 years (my entire life). Except we didn’t call it bone broth, we just called it soup. Because, like stated at the beginning of the article, that’s just how it was always made. I make it now, my mother made it before me, my grand parents before her, etc, etc.